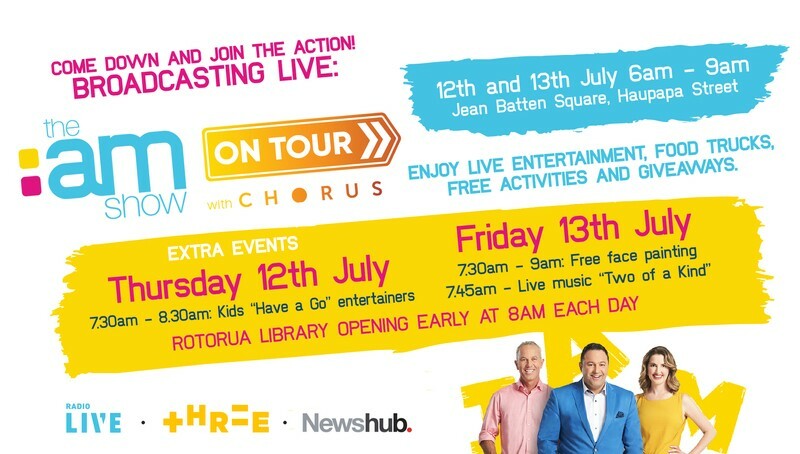 Come down and join the action as The AM Show is broadcast live from Jean Batten Square (outside Rotorua Library) on Thursday 12 and Friday 13 July from 6am – 9am. Grab breakfast from the food and coffee trucks and Rotorua Library will be opening early from 8am. Enjoy live entertainment and fun activities with passes to local attractions to win. Chorus will be available to answer all your broadband and fibre questions and have some free giveaways. On Thursday 12 July kids can join in on some circus fun in the "have a go" area where families can try out hula hoops, poi, ribbons from 7.30am – 8.30am. On Friday 13 July there will be free face painting between 7.30am – 9am and local duo Two of a Kind will be performing from 7.45am.